Melt margarine in large skillet over medium heat. Add garlic and chile; cook and stir 1 to 2 minutes or until tender. Add rice; cook and stir 1 minute. Slowly stir in broth and water. Bring to a boil. Reduce heat to low; cover and simmer 15 minutes. 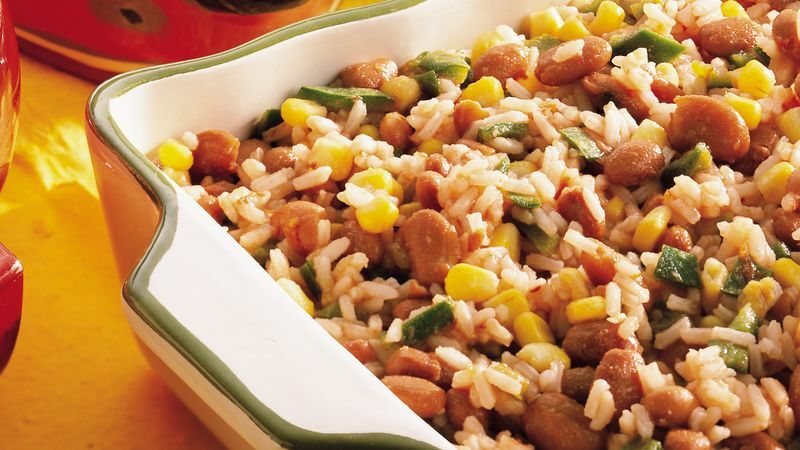 Add beans and corn; mix well. Cook an additional 5 to 10 minutes or until rice is tender and liquid is absorbed. Stir in chili sauce. Cook until thoroughly heated. Poblano chiles are 4 to 5 inches long and very dark green. They taste mild to slightly spicy. Sometimes called red Mexican beans, dry pinto beans are pale pink with streaks of reddish-brown. When they are cooked, they lose the streaks and become all one color. Top this rice with chopped fresh tomatoes and shredded Cheddar cheese. Serve as an accompaniment to burritos, tacos, enchiladas, grilled chicken or pork chops.